Start with fresh ingredients. That's the key to perfection. An instant party favorite! It will be your new go-to dish! 1. In a non-stick skillet fry bacon strips. Place on a napkin to absorb excess oil. 2. Dice red onion, tomato and red bell pepper. Seed tomato (important) and jalapeno (optional). Slice lime in half and chop up cilantro and bacon. 3. Cut avocados in half and remove pits. Cut vertical and horizontal strips directly in the shell of the avocados, then scoop out with a spoon into a mixing bowl. Use either a fork or tomato masher and mash. 4. 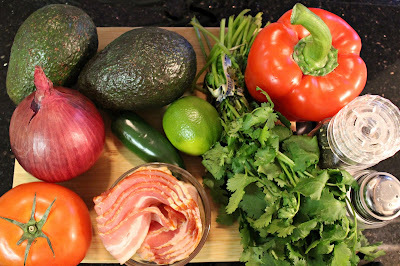 Add all ingredients to mashed avocado. 5. 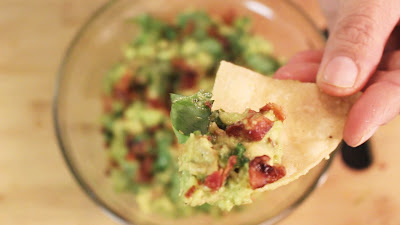 Put in a serving bowl and garnish with cilantro and bacon.